What is the Hourly Pricing program? Illinois was the first state in the country to launch a statewide residential Hourly Pricing program. It offers ComEd customers a new way to pay for electricity, charging them a supply rate that can change on an hourly basis, instead of the standard price that stays the same 24/7. Hourly Pricing has saved participants an average of about 15 percent on the supply portion of their power bills, although savings aren’t guaranteed. An ongoing analysis of energy-usage data by CUB and Environmental Defense Fund (EDF) has found that most ComEd customers could save money under the program, with even better results for those willing and able to change how and when they use major appliances. Visit the ComEd website or call 1-888-202-7787 to learn more. The program is managed by Elevate Energy, a Chicago-based nonprofit organization dedicated to helping people save energy and money. ComEd traditionally charges residential customers a fixed electric rate that changes only twice a year. But Hourly Pricing customers pay a market price that can change every hour. 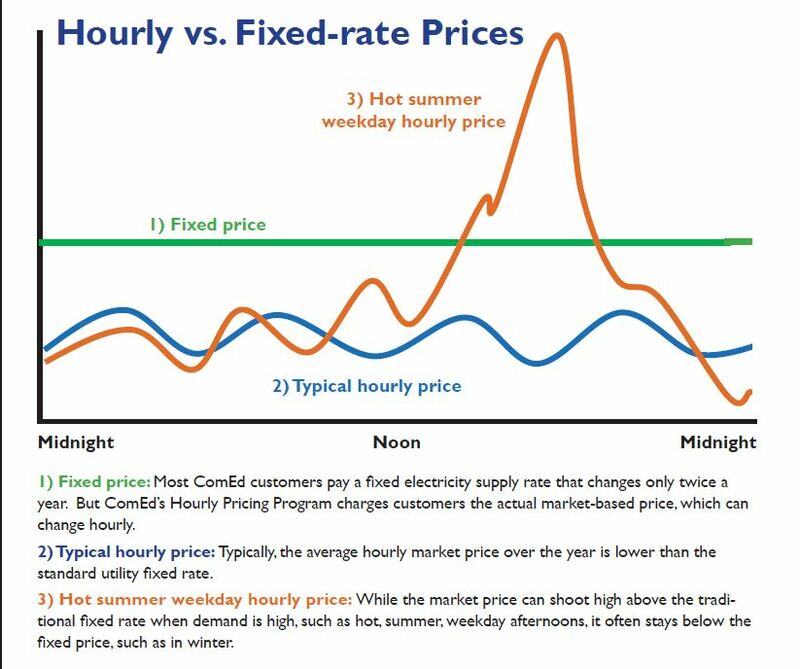 This price variability may sound scary, but for most of the year the hourly rate is lower than ComEd’s default flat rate. The Hourly Pricing program gives you a number of tools to help you adjust your electricity-usage habits. If the price is expected to climb above a certain predetermined level (14 cents per kWh), you will get a call or e-mail the night before, suggesting you change your power usage the next day to avoid high-price times. Plan your energy usage by checking the “dayahead” prices—a highly accurate estimate of the approaching day’s hourly prices—either by phone or online. The program also provides tips on cutting your energy costs and personalized online account information to track whether or not you are saving under the program. curious about how to cut their power bills by changing when they use their electricity. You can leave Hourly Pricing at any time, but it’s a good idea to stay with the program for at least a year. Pricing patterns and your usage change with the seasons, so it’s best to evaluate the program after you have received 12 months of bills. If you leave Hourly Pricing, you cannot rejoin the program for a period of 12 months following the termination. Most charges on your bill will remain the same. However, some line items in the supply section of your bill will diff er from the standard fixed rate. As with standard bills, your Hourly Pricing bill will include an Electricity Supply Charge, a Transmission Services Charge, and a Purchased Electricity Adjustment. However, the rates will diff er from those on a standard fixed-rate bill. Additionally, your Hourly Pricing will include separate line items for a Capacity Charge and the miscellaneous Procurement Component Charge. But this doesn’t mean you’re paying extra charges. You still pay Capacity and Miscellaneous Procurement costs on standard bills, but they’re included in the Electricity Supply Charge. Hourly Pricing customers can find an online breakdown of how much electricity they used and the rate they paid each hour over that period at HourlyPricing.ComEd.com. With AC Cycling, a special device attached to your central air conditioner allows the utility to send signals to your home to “cycle” the flow of power to the cooling unit (i.e. to turn the cooling on and off ) at peak times of energy usage. Similarly, “Load Guard” participants can have their air conditioners cycled on and off during periods of high prices. You can choose to enter into this “conservation mode” when power prices hit either 10 cents per kilowatt -hour (kWh) or 14 cents per kWh. When your AC is cycled on and off , the fan stays on so Load Guard isn’t expected to change a home’s temperature dramatically—maybe as little as 1-3 degrees. -Temporarily change your central air conditioner to a warmer temperature. (Take advantage of AC Cycling and Load Guard.) If you have a window air conditioner, turn it off or put it on a warmer setting. -If the summer heat gets to you, plan a trip to the beach or a pool during the peak hours. Or hang out in an air-conditioned public space, such as a movie theater, museum, shopping mall, or library. -If you have an electric stove or oven, grill or enjoy a cool meal like a sandwich or salad. -Use energy-guzzling appliances like the dishwasher, washer and dryer, and basement dehumidifier in the morning or evening when prices are lower.